Never let it be said that Barbie doesn’t have an eye for emerging trends. After forays into everything from aeronautics to zookeeping, America’s favorite plastic dilettante is poised to tackle the Next Big Thing: smart clothing. Unveiled at the 2013 Toy Fair in New York City, the upcoming “Digital Dress” doll features an interactive touchscreen frock that lets just about anyone “draw” their own animated designs, no programming experience necessary. Each dress comprises a 4.5-inch resistive touch panel, as well as 114 multicolored LEDS that can be turned on and off with a finger or the included stylus. A triple-heart necklace serves to activate one of three modes. Kids can choose from preloaded graphics like hearts and fireworks, manipulate their own custom patterns, or watch designs dance in response to sound or music. Each dress comprises a 4.5-inch resistive touch panel, as well as 114 multicolored LEDS. As gimmicky as it sounds, the open-ended play is definitely a plus. It might even pique some girls’ interest in STEM. Recommended for ages 6 and up, the doll is expected to go on sale in August for $49.99. Never let it be said that Barbie doesn't have an eye for emerging trends. After forays into everything from aeronautics to zookeeping, America's favorite plastic dilettante is poised to tackle the Next Big Thing: smart clothing. 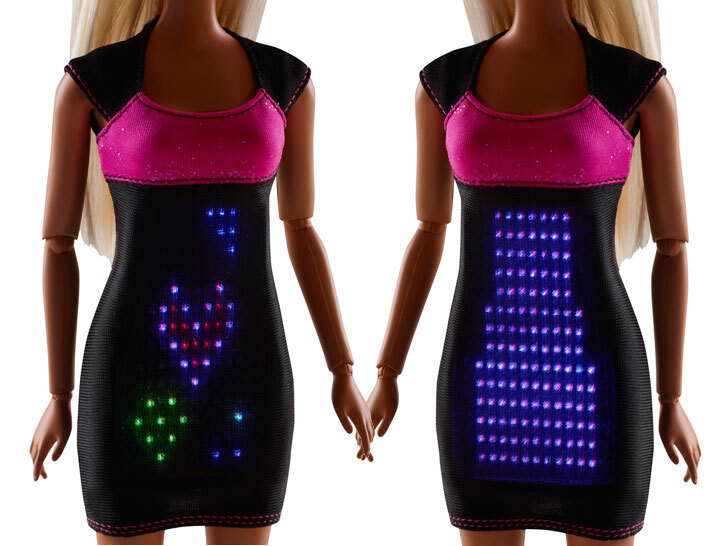 Unveiled at the 2013 Toy Fair in New York City, the upcoming "Digital Dress" doll features an interactive touchscreen frock that lets just about anyone "draw" their own animated designs, no programming experience necessary.